“After almost 8 years of conflict in Syria, the consequences are indescribable, above all for the little children. Through our campaign we want to raise awareness of the critical conditions into which the country has been plunged and pray for peace and reconciliation.” The words are those of Philipp Ozores, the Secretary General of the international Catholic pastoral charity and pontifical foundation ACN International, who yesterday presented the charity’s campaign Candles for Peace in Syria at the Polish embassy to the Holy See in Rome, an awareness raising campaign formally launched by Pope Francis the day before. 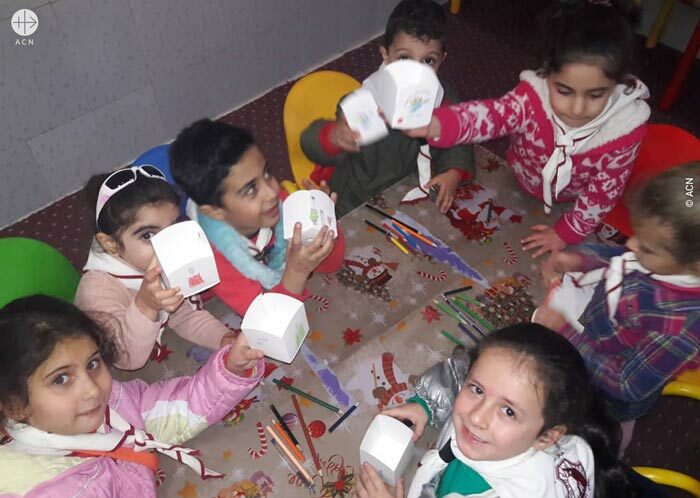 In the days leading up to the event over 50,000 children of different religions, from a number of different Syrian cities, had painted images and symbols of peace on the side of their candles. 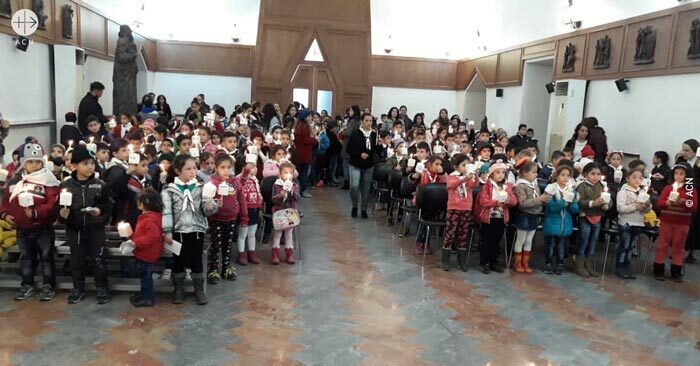 ACN is calling on people of goodwill around the world to respond to this heartfelt cry for peace from the children of Syria, by lighting a candle, as Pope Francis did after the Angelus blessing in Rome on Sunday. “Our brothers and sisters in the Middle East are the Jerusalem of today”, stated the Polish ambassador to the Holy See, Mr Janusz Kotański, before handing the word to the invited guests from Syria with first-hand experience of the situation. Cardinal Mario Zenari, the apostolic nuncio in Damascus, described the civil war in Syria as a “slaughter of the innocents” in which many children had been “killed by bombs, drowned in the ocean, suffocated by poison gas, mutilated, traumatised, subjected to sexual abuse, forcibly enlisted in the Army or else – as has happened to many young Syrian girls – forced to “marry” total strangers at an extremely tender age”. Sister Annie Demerjian, a Syrian religious of the congregation of the Sisters of Jesus and Mary, displayed some powerful images of the suffering caused by the war, a suffering that she herself witnessed in Aleppo along with its people. “It is difficult to imagine how much the Syrian children had to endure. Children robbed of their childhood and of the joy which should characterise their youthful years”, she explained. “During these years the faces of the Syrian children have cried out for help. By lighting these candles we can give them hope”, added Father Andrzej Halemba, the head ACN’s project section for the Middle East. 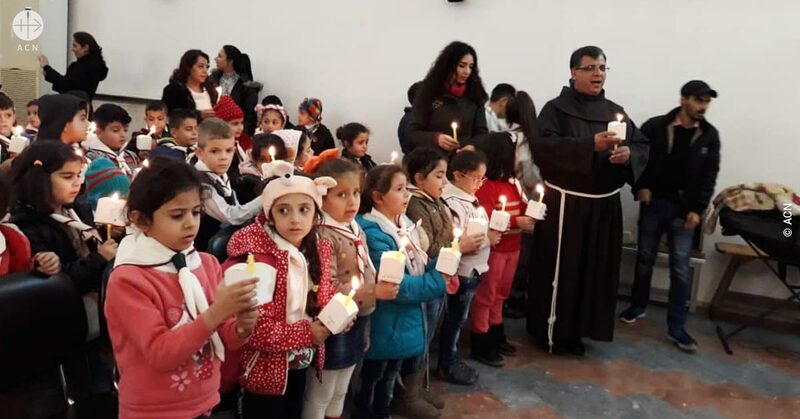 He then opened up a live video linkup with a group of children in a primary school in Aleppo, during which both the children in Syria and the ambassadors and other guests in Rome, following the example of Pope Francis, lit up candles made in Damascus. After this Cardinal Zenari lit the first digital candle in ACN’s online campaign “Light a candle for peace”.